It’s always nice to have a few easy no-cook side dishes to make when the weather is hot, or you don’t feel like cooking. 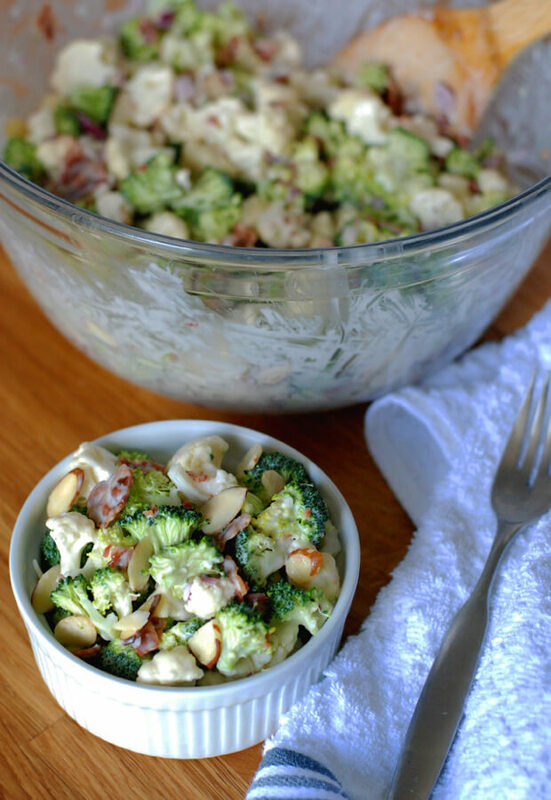 This broccoli cauliflower salad combines fresh raw veggies, crunchy nuts, creamy dressing, and of course bacon. Everyone knows everything’s better with bacon. This salad is super easy to make; the hardest part is chopping all the veggies. Be sure to use only the florets from both the broccoli and the cauliflower. I use pre-sliced almonds (found in the baking section of the grocery store) to have one less thing to chop, but any nut would work well in this recipe. I have also used pre-cooked (no sugar added) bacon as another shortcut to shorten the prep time. The dressing for this salad is the perfect combination of sweet and tangy. Mayonnaise-based dressings can sometimes be heavy and overwhelming, but using half sour cream lightens it up a little bit and still keeps the carbs low. Just be sure to use the full-fat variety! 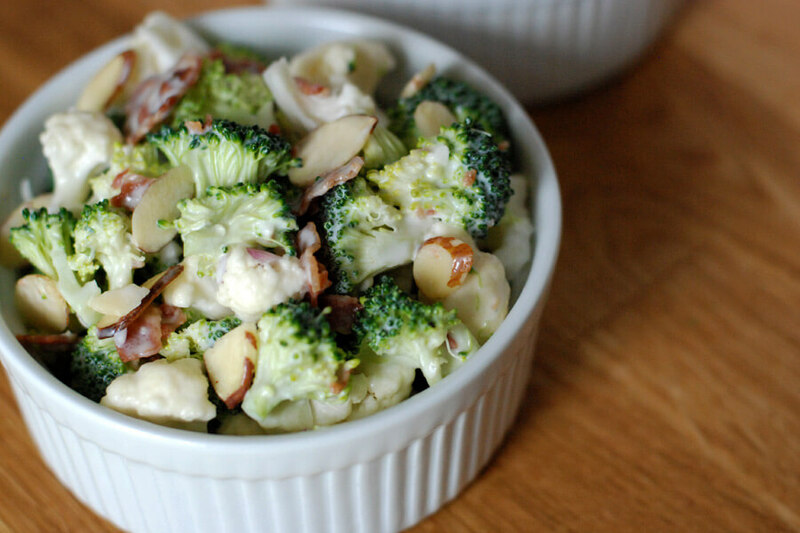 Broccoli-cauliflower salad is a great recipe to make a day ahead as it’s even better after being refrigerated overnight. I love to take this dish to potlucks, barbecues, or luncheons where it’s often hard to find keto-friendly side dishes. Everyone will enjoy this salad and no one will even notice that it’s low-carb and sugar-free! 1. Whisk the mayonnaise, sour cream, apple cider vinegar, Swerve, salt, and pepper in a medium sized bowl (or mason jar). Set aside. 2. 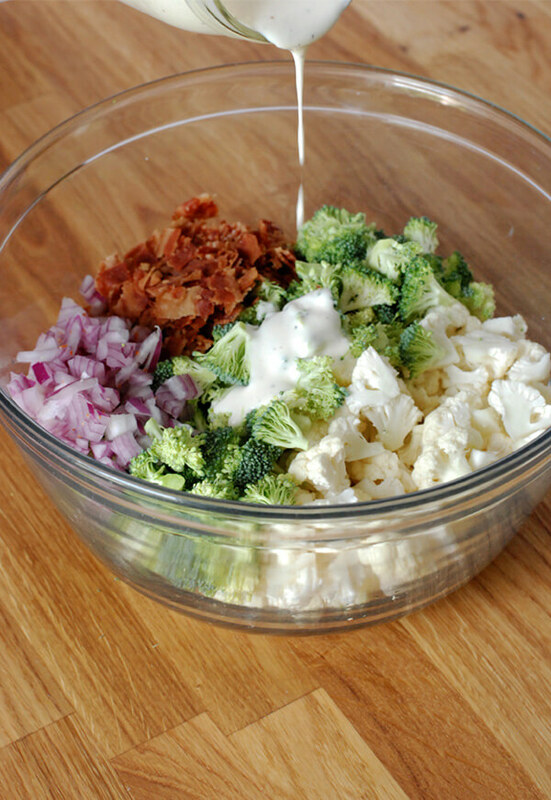 Add the chopped broccoli and cauliflower, onion, crumbled bacon, and sliced almonds to a large bowl. 3. Drizzle with prepared dressing and toss to combine. 4. Salad can be served immediately or refrigerated up to 24 hours before serving. The vegetables get better the longer the flavors are allowed to combine in the fridge! 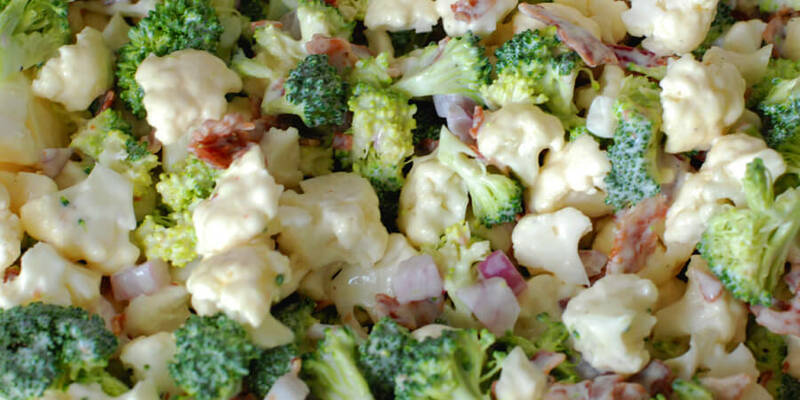 This makes a total of 8 servings of Broccoli Cauliflower Salad. Each serving comes out to be 207.75 Calories, 18.26g Fats, 4.17g Net Carbs, and 5.79g Protein. 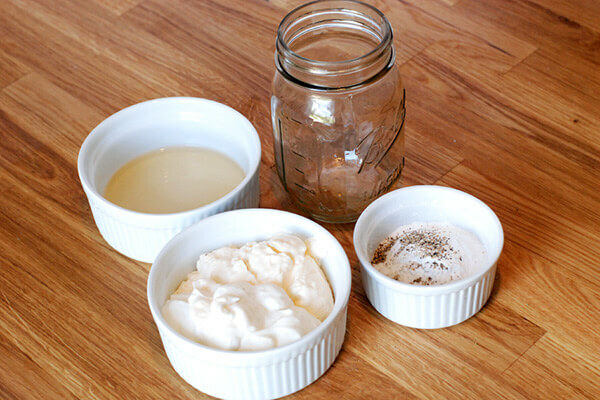 Whisk the mayonnaise, sour cream, apple cider vinegar, Swerve, salt, and pepper in a medium sized bowl (or mason jar). Set aside. 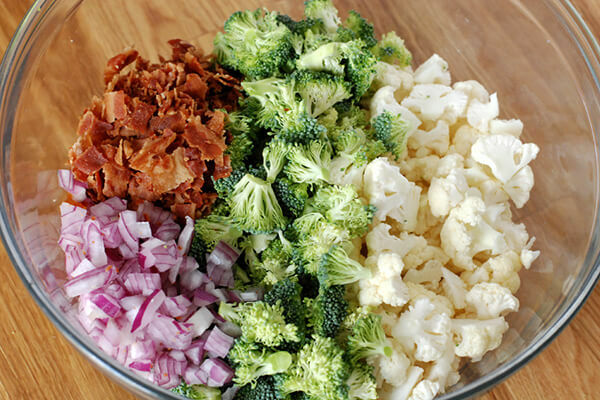 Add the chopped broccoli and cauliflower, onion, crumbled bacon, and sliced almonds to a large bowl. Drizzle with prepared dressing and toss to combine. Salad can be served immediately or refrigerated up to 24 hours before serving. It gets better the longer the flavors are allowed to combine in the fridge!